1st A bit of history...Glass bead making (or lampworking) is an ancient art that has been practiced for more than 3,000 years.Â When humans first developed tools to drill holes in shells, bones and other natural objects, they made glass objects as well. The earliest glass beads are thought to date as far back as 1400 B.C., as found in Egypt. Many cultures have used, adorned and traded glass beads, and they are still prized for their ornamental and collectible value today. For centuries, glass beads have been used for adornment, trade, currency, and religious rituals in cultures all over the world. Yet throughout history, the art of making glass beads has been shrouded in great secrecy until recently where others have obtained the technical knowledge to make glass beads. How it's done, layman's terms...The art of glass bead making is done by winding molten glass around a steel rod called a mandrel. This is often referred to as "Lampworking". This name is derived from the early glass bead makers in Venice who used oil lamps as their heat source for melting the glass. Today lampworking is usually done with a fuel gas and oxygen torch and a few hand tools. Although the basic tools have changed, the tricks and techniques used to form and decorate the glass haven't changed much in Millenniums. Lampworking is an ancient technique of using a very hot flame to melt glass. It involves the process of melting and winding glass (usually from rod or strip) under a very hot flame onto a mandrel.Â (The mandrel is first coated with a bead release agent so the finished glass bead will come off easily after annealing). The molten glass is wound around the mandrel until the desired size and bead style are achieved. The flame used to melt the glass is produced by mixing gas, either natural or propane, and oxygen. Thus the flame produced is hot enough to melt the glass. 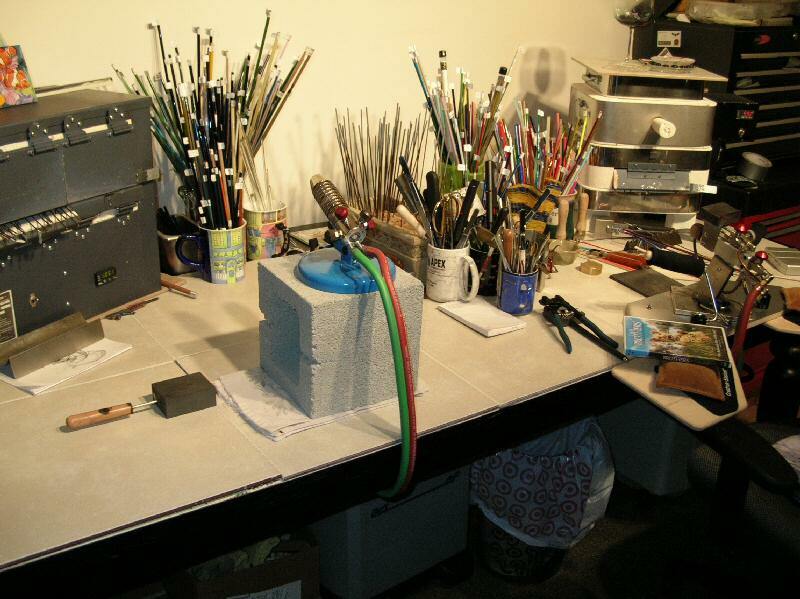 A torch is the primary tool for lampworking and making glass art. Once a bead is formed and the artist is finished with the actual creation process there are several more steps involved before the bead is ready to be used in fine jewelry. The bead is then placed in a kiln to start the annealing process. Annealing is the process of slowly reducing the temperature of the hot glass. 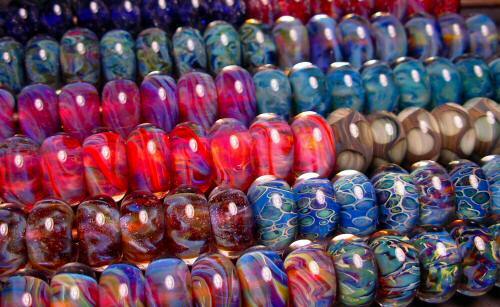 The annealing process makes glass beads very strong and durable. Beads that have not been annealed will have "stress" in them, which means that on a molecular level, the glass is unstable, and outside forces (falling on the ground, temperature, pressure, etc.) can cause them to develop cracks, stress fractures, or even break. In order to relieve this stress, the bead is held at a very precise temperature range for specified periods of time in the kiln. We use a kiln "controller" which starts the beads out at about 1,050 degrees and slowly ramps down by 100 degrees per hour until the bead is brought to room temperature. When a bead is taken out of the kiln it is still on the stainless steel mandrel. Before removal, the cooled bead is then soaked in water to soften the bead release agent. Once the bead is removed from the mandrel the holes are cleaned and filed with a Dremel diamond file. They are then ready to become gorgeous jewelry to bring years of happiness. In closing...Artist made Lampworked glass beads are one of a kind, and are considered to be artwork that is wearable.Â No two beads are exactly identical. If you own lampwork beads in jewelry you can be sure that you own a one of a kind piece of art! The draw for today's modern jewelry consumer to Lampwork is within the fact that you own a one-of-a-kind piece of art! The Glass Artist who created your beads actually sat down, chose colors from a palate and created the beautiful designs that came from their soul. This is a long rewarding process that deserves a great deal of respect for the "natura" ability that comes from that individual. Unfortunately, not everyone possesses the skills to design Glass Art Beads (just as the idea that not everyone can "sing" beautifullt-trust me, I'm one of those people!) but the beautiful part of this is that there are a select few Glass Artists out there that are creating their wonderful works of art and making them available to the world. This ancient form of artistry is now becoming more available and each lovely design is made with skill, thought, creativity, and love. Another wonderful source of information about the Art of Lampwork Glass Beadmaking can be found at the International Society of Glass Beadmakers website. 5 Fish Designs Studio - Where it all happens!